Parks Not parkways | Advocating for sustainability and environmental justice. Sustainable Trent has been part of the Peterborough/Nogojiwanong community mobilization to protect greenspace and oppose the City’s plans to build a 4-lane road through the centre of the city, including a bridge over Jackson Park, a beautiful natural space located in the West End of Peterborough. In Fall 2013, we donated $500 to the Peterborough Greenspace Coalition to aid in its Parks Not Parkways campaign. Members of Sustainable Trent spoke at the City Council meeting in November, making the case that our transportation priorities in this city should be greenspace, public transportation, and cycling and pedestrian infrastructure, rather than roads which will only create more traffic problems and destroy greenspace. Despite the chorus of community voices in opposition to the Parkway, councillors voted 8-3 in favour of the proposal, and 6-5 against a motion to remove the bridge over Jackson Park from the project. Their decision was unfortunate and undemocratic, but the fight is far from over. Even though there will not be a public referendum on the Parkway, the upcoming municipal elections this October represent a chance for residents of Peterborough to have our voices heard. We can do our best to vote out those councillors who support the Parkway, and vote in those who will be committed to greenspace and public transportation, and focus on pressing priorities such as poverty reduction rather than road construction. A new Council could revisit the Parkway proposal, and remove it from the City’s transportation plan. In our presentations to City Council, we promised to launch a campaign at Trent University to encourage students to vote in the Peterborough municipal elections, bringing in young voters who could sway the results against councillors who voted for the Parkway, and in support of those candidates who promise to be leaders in environmental sustainability and social justice. Candidates running for Council will be confirmed in the coming months. Stay tuned for updates on how you can get involved in the municipal election, to bring the change we need to leadership in this City. Want to get involved? 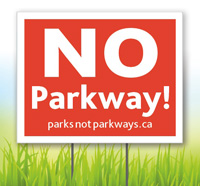 Send us an email at sustainabletrentu@gmail.com, or contact the Peterborough Greenspace Coalition (www.parksnotparkways.ca). 1. The Current Parkway Proposal—a $66 Million Walled Street?